Chillola is a website designed to let children explore different languages. The site has lots of basic Spanish vocabulary accompanied by images and native-speaker audio. It also has a variety of printable activities. The vocabulary is divided into categories including numbers, colors, shapes, school words, animals, fruit, vegetables, food, the calender, weather, time, house, vocabulary, prepositions, and opposites. 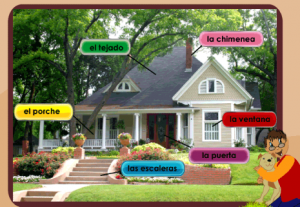 The activities for several of the categories show one screen with pictures of all of the vocabulary and the words in Spanish. Kids click on the pictures to hear the word pronounced. For other categories, kids scroll through images and click on the speaker to hear the words pronounced. The pictures make the meaning of the words clear. Some of the categories show the singular and then the plural, and some, like the animals have an impressive number of images and words. Most of the vocabulary on this Spanish website is not used in sentences or given a context other than the category and the picture. The website is designed to provide initial exposure to the language, but you can make the activities more meaningful by using full sentences and talking about the pictures with your child. If you use simple sentences like Es un gato, or Veo la manzana your child will hear more natural language. Chillola has a set of printable activities that go with the vocabulary. They mostly consist of matching words to pictures and labeling. There is a nice wheel for las estaciones del año (seasons of the year) with the seasons and months that you can print in color or black and white. Just a note, there is an error on a couple of the printable worksheets about opposites. Instead of the Spanish words for long and short, the worksheets have the Italian words. Chillola is intended to give kids an introduction to different languages. The pictures, audio and printables make it useful for teachers and parents, especially if they use the words in sentences and create a context for the Spanish children are learning. Printable Spanish Activities - Think Spring!